We are a community club upholding the belief that football is for all regardless of ability, and in that spirit we have never held ‘trials’. We are affiliated to both The Winchester and District Girls' Football league and the Testway Youth Football League. Games are played on a Saturday morning at our home grounds of Eversley Park, Kings Worthy and the Garrison Ground Bar End for girls' football. At present, from humble beginnings, we are now the largest club in the Testway League, with three girls' teams and 14 boys' or mixed gender teams, as well as a dedicated goalkeeping coach who works across the age groups. We take the FA’s Respect campaign as our foundation and we believe that team spirit, fun, fantastic parents and players and a love of football are what makes us a true community club. The existing junior section of the club was formed in 1997 with an under 9s team who played in the North Hants Youth League. Until the 2005/06 season the club operated under the loose umbrella of the Worthies Sports and Social Club. Within this all teams were run independently with separate funding, management and coaching. There was co-operation between teams with players' kit, management of pitches, child protection and presentation evenings, but no formal structure existed. 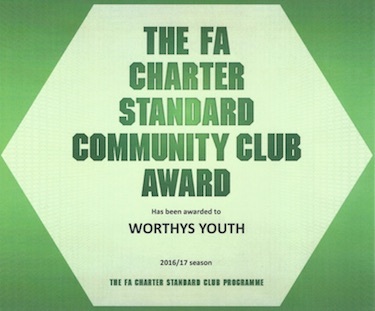 In January 2006 the Worthys Youth Football Club was established. The committee comprised coaches only, with Andy Court presiding as Chairman, ably assisted for many years thereafter by Mike Bridge, Peter Wooldridge, Tim Beanland and Richard Allerston. In August 2006, only eight months after joining forces, the club was awarded the FA Charter Standard Development Club status. This achievement has been recognised by the Hampshire FA, who have used the club as a model of good practice for other clubs in the county. The Club was awarded the ‘Best Development Club’ award from the Hampshire FA for 2006/07 in May 2007. Club volunteers were also awarded Coach of the Year and Volunteer of the Year at the Winchester SPAA awards in 2010 and WYFC picked up Club of the Year in 2012. The latter was given in recognition of the club’s commitment to inclusion and to the development of girls' football. The various teams have had their successful seasons and have won both league titles, runner-up awards and tournament accolades. We have also been regular recipients of the League’s Fair Play awards at the end of the season. We now have upwards of 20 FA Level 1 qualified coaches and a committee of 14 men and women volunteers to ensure the club’s members are well looked after. The Club was awarded Hants FA’s ‘Charter Standard Community Club of the Year 2014’. As a large club, we now have a partnership with Kings Worthy Primary School and use their two excellent pitches for the younger ages. We are always welcoming new coaches and players where numbers allow as well as promoting adults and teenagers towards their refereeing badges and towards joining the committee. At present we have young people assisting three teams as part of their Duke of Edinburgh Award. The club believes in investing in people and we would love new people to step forward and join our community. Should you wish to become involved, please contact our Secretary Kelly Valentine, details under 'Contact'.